The mentorship I had under Senator Bob Mensch was possibly one of the most interesting, amusing, and exhausting experiences I ever had. From the moment the mentorship started, I was bombarded with an actual list of the people we had to meet, issues that had to be discussed, and places that we had to go. Even while waiting between meetings, the Senator’s time was consumed with checking emails or problem solving. Yet, what was most striking is that while all this is happening, he went to and from Harrisburg to negotiate the state budget. But during the time we had to sit down and talk with each other, normally no more than 10-15 minutes, is what made the experience enlightening. Through being able to sit down and discuss how things work behind the scene and hear stories of stressful, odd and frustrating situations, I left each day with a new misconception shattered that I never knew I had. The job itself would often include working for hours on a task to find it irrelevant or make no progress at all, having as little as four hours of sleep, or facing situations that arise in the moment while being told continuously to do it differently. This makes for an obviously stressful day-to-day lifestyle, which is only supported by the staff being able take care of as many task as possible. Yet, even then it is almost safe to say that I interacted with the chief of staff more than the Senator even while in the office. This edition of the Mensch Report features my 4th annual Veterans Appreciation Breakfast which was held on November 7 at the Upper Perkiomen Valley High School. Over 400 veterans and their family members attended the event. The event featured special guest speaker Captain Joanne Powell-Smith from the Pennsylvania Army National Guard. Captain Powell-Smith currently serves as the Behavioral Health Officer for the 56th Brigade. In addition, US Congressman Michael Fitzpatrick, US Congressman Ryan Costello, State Representative Marcy Toepel, and State Representative Justin Simmons gave formal remarks to the veterans. Veterans also enjoyed patriotic songs performed by the Upper Perkiomen High School Women’s Choir. Guests were also able to learn more about the Bucks County veteran ID program, the Critter Corral (a vocational rehabilitation therapy program, veteran’s benefits, veteran’s programs and more. Visit my website to view photos from the breakfast as well as previous editions of the Mensch Report. Construction began November 17 on a $6.8 million project to rehabilitate three structurally deficient bridges in Bucks and Montgomery counties, three structurally deficient culverts in Bucks County, and to stabilize a stream embankment at a bridge in Bucks County. This transportation improvement project is financed with 100 percent state funds from Act 89, Pennsylvania’s transportation plan. The Graterford Road Bridge over the Perkiomen Creek in Perkiomen and Skippack townships, Montgomery County, is the first bridge scheduled to undergo construction. Crews have already begun to work on rehabilitating the three-span bridge that was closed in June 2014 due to severe structural deterioration. PennDOT’s contractor will restore the bridge by replacing the deck and beams, repairing the piers and support abutments, and upgrading guide rail. The Graterford Road Bridge is expected to reopen to traffic in late April 2016. Built in 1957, the Graterford Road Bridge is 218 feet long and 26 feet wide. The structurally deficient bridge was posted with a 14-ton weight limit and carried 2,900 vehicles a day at the time of its closure. The bridge was closed following an inspection when it was determined that the beams and deck had deteriorated to the point that it could no longer carry vehicular traffic. During construction, Graterford Road through traffic will continue to follow the posted detour of Route 29, Plank Road, and Route 73. Motorists are advised to allow extra time when traveling through the area. In spring 2016, the contractor is expected to start construction to repair the Oxford Valley Road Bridge over U.S. 1 in Langhorne Borough, Bucks County. Crews will repair the structural damage the bridge sustained when it was struck by an oversized truck earlier this past summer. The contract also includes the replacement of culverts at the following locations in Bucks County: Route 313 (Dublin Pike) over Morris Run in Hilltown Township; Old Lincoln Highway over a branch of Neshaminy Creek in Bensalem Township; and Main Street/Bethlehem Pike over Wertz Creek in Sellersville Borough. In addition, concrete and sub-structure improvements will be made on the Route 611 (Easton Road) bridge over a branch of Neshaminy Creek in Doylestown Township, Buck County, and stream embankment stabilization enhancements will be performed at the Kellers Church Road Bridge over Deep Run in Bedminster Township, Bucks County. All work on the $6,824,000 project is scheduled to be completed in late 2018. The general contractor is Loftus Construction, Inc. of Cinnaminson, N.J. 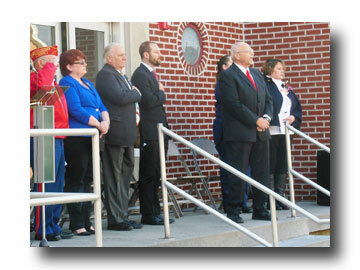 Senator Mensch participated in the Pennsburg Borough Veterans Day ceremony on November 11 with local officials and constituents. Pennsylvania Department of Agriculture officials announced that the spotted lanternfly quarantine has been expanded after small populations of the pest were detected in Amity and Douglass Townships, both in Berks County. The two recent detections are in townships adjacent to previous quarantine areas. The pest had not been found in the United States prior to its initial detection in Berks County last fall. Areas where the pest has been found are now under quarantine. The general quarantine restricts movement of any material or object that can spread the pest. This includes firewood or wood products, brush or yard waste, remodeling or construction materials and waste, packing material like boxes, grapevines for decorative purposes or as nursery stock, and any outdoor household articles like lawnmowers, grills, tarps and other equipment, trucks or vehicles typically not stored indoors. Berks County: Amity, Colebrookdale, District, Douglass, Earl, Hereford, Longswamp, Oley, Pike, Rockland and Washington townships and the boroughs of Bally, Bechtelsville, Boyertown and Topton. Spotted Lanternfly, Lycorma delicatula, attacks grapes, apples, pines and stone fruits. It often attaches to the bark of Tree of Heaven ( Ailanthus altissima), an invasive species similar to Sumac that can be found around parking lots or along tree lines. Adults often cluster in groups and lay egg masses containing 30-50 eggs that adhere to flat surfaces including tree bark. Freshly laid egg masses have a grey waxy mud-like coating, while hatched eggs appear as brownish seed-like deposits in four to seven columns about an inch long. Trees attacked by the Spotted Lanternfly will show a grey or black trail of sap down the trunk. 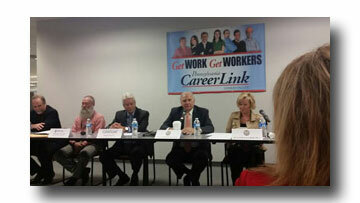 Senator Mensch and Senator Boscola, Co-Chairs of the Economy, Business and Jobs Caucus, participated in a panel discussion for a Jobs and Employment for Veterans event at the PA CareerLink Lehigh Valley center in Allentown. Colder winter weather is on the way and the Pennsylvania Department of Environmental Protection wants all residents to stay safe and warm this winter by properly preparing their homes. Home winterization can help keep your home warmer, while using less energy and costing less money. According to the U.S. Energy Information Administration, the average Pennsylvania family consumes more than 10,000 kWh of electricity annually and spends more than $2000 per year on energy bills. Half the energy consumed in Pennsylvania homes is for space heating. Fortunately, homeowners can take small steps to make their home safe and more efficient. Set back the thermostat; each degree lowered can save up to 3 percent on heating. A programmable thermostat, which cost as little as $20 at a local hardware store, can be programmed to be setback automatically at designated timeframes, saving you more energy and money. Clean warm-air registers, baseboard heaters, and radiators regularly and make sure they are not blocked by furniture, carpeting, or drapes. Weather-strip windows and exterior doors where you can feel air leakage. Check the bottom of the door to see if there is a gap. If there is a gap of a quarter inch or more, significant air can flow in and out of the house. Install a door sweep on the bottom of the door. Weather-stripping for the windows and doors is available in foam, rubber, vinyl and metal. For homes without storm windows, consider purchasing a window insulator kit (plastic window coverings). Install insulating drapes or curtains for windows that still feel drafty after weatherizing. Use the sunlight to heat your home by opening the curtains on south-facing windows during sunny days and close all curtains at night. Check the door to the attic to make sure it seals well and closes tightly. Some manufacturers make insulated attic covers. Do not heat unused spaces, other than as needed to prevent freezing of pipes. Close vents in unused rooms. If you have a wood stove, be sure to clean the flue vent and inside of the stove regularly. If you have a fireplace, reduce heat loss from the fireplace by keeping the damper closed; when open, warm air goes up the chimney. Install tempered glass and a heat-air exchange system that blows warmed air back into the room. Check the seal on the fireplace damper and ensure it is snug and add caulking around the hearth. It is a good idea to have a carbon monoxide monitor, as well. If you have a furnace, have it checked by a heating professional. This will make the unit more efficient, and provide peace of mind that it is running safely. A heating professional should check the exhaust flue and venting to prevent carbon monoxide poisoning. Be sure to replace the air filter as directed to keep the air in your home clean and the unit running well. A properly maintained furnace can result in a 10 percent reduction in fuel consumed. The most cost-effective way to save energy in the home is to air seal and insulate. Be sure to air seal before insulating as insulation material will not block leaks. Find and seal air leaks with caulk around windows, doors, gaps around chimneys, and recessed lights in insulated ceilings. Fill larger cracks with spray foam. Always follow the directions on the caulking and spray foam containers to ensure proper adherence and safety. After all the cracks are filled, you can install the insulation. Use the U.S. Department of Energy’s insulation page to determine what kind of insulation you should use and how to put it in your home. 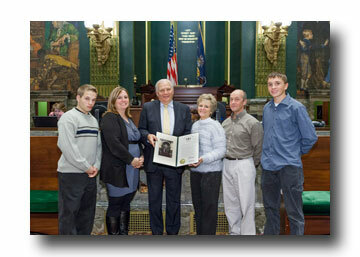 For more information about home winterization, visit www.dep.state.pa.us. My office will be assisting in the Upper Perkiomen Valley Community Job Fair on December 11 at the Upper Perkiomen Valley YMCA. If you are interested in attending, please see the details below. If you have additional questions, please call 215-541-2388.